London architect Sophia MacKenzie receives a phone call from her mother asking her to return home to Suffolk because they need to talk. Sophia, enjoying a night out with colleagues and over the legal limit to drive, puts her mother off until the following day. But when Sophia does arrive home, her parents aren't there. Venturing into the garden she finds her mother's lifeless body hanging from a tree and her father lying near-death in a pool of blood. Sophia is astonished to learn her mother was a member of a cult in the 1980s and had written three notebooks about her life inside The Order of the Ascendants, which are going to be published. As Sophia begins to read the notebooks, it becomes apparent her mother's hanging and the near-fatal attack on her father are somehow connected to their contents. Oh what a wonderful tangled web of intrigue this book is! The timeline is split seamlessly between Sophia in the present and her mother Nina in the past. The reader is given small pieces of the puzzle. Some are easily figured out - which I suspect is the author's intention, but others are cleverly interwoven until the final chapters. The suspense gradually builds as the two timelines come together and Sophia finally discovers the truth about her mother's past and the repercussions for the present. 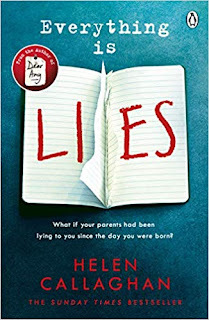 The book title tells the reader Everything is Lies; therefore I was constantly questioning motives - was everything as it appeared to be or was there something much more sinister lurking under the surface? Oh boy, was I paranoid or was I paranoid?! When that happens, I know I'm reading a a quality piece of fiction. I thought the main characters were developed to a tee. Cult leader Aaron Kessler literally jumped off the pages as he was brought to life by the author. His charisma and control were both unsettling and disturbing. The two timelines worked extremely well and the conclusion was exactly as it should have been. In my opinion this is an excellent psychological thriller and I have no hesitation in placing it as a Top Read of 2018. I received an Advance Reader Copy. My thanks to NetGalley, Helen Callaghan and Penguin UK - Michael Joseph. Sophia's parents lead quiet, unremarkable lives. At least that is what she's always believed. Until the day she arrives at her childhood home to find a house ringing with silence. Her mother is hanging from a tree. Her father is lying in a pool of his own blood, near to death. The police are convinced it is an attempted murder-suicide. But Sophia is sure that the woman who brought her up isn't a killer. As her father is too ill to talk it is up to Sophia to clear her mother's name. And to do this she needs to delve deep into her family's past - a past full of dark secrets she never suspected were there . . .
What if your parents had been lying to you since the day you were born? My name is Helen Callaghan and I write fiction whenever I’m left unsupervised. I live in Cambridge amongst teetering piles of books. I’ve always written, it’s my one constant. I was at various points a student nurse, barmaid and drama student. Eventually I settled into bookselling, working as a fiction specialist and buyer for a variety of bookshops, and did that for nearly ten years. In the end I became restless and studied for A-levels at night school. I achieved a place at Cambridge University as a mature student, where I studied Archaeology. When I’m not writing fiction I write technical documentation for IT companies, which is every bit as thrilling as it sounds.